Elite memory athletes are not so different from their peers in any other sport: They face off in intense competitions where they execute seemingly superhuman feats such as memorizing a string of 500 digits in five minutes. Most memory athletes credit their success to hours of memorization technique practice. One lingering question, though, is whether memory champs succeed by practice alone or are somehow gifted. Recent research suggests there may be hope for the rest of us. A study, published today in Neuron, provides solid evidence that most people can successfully learn and apply the memorization techniques used by memory champions, while triggering large-scale brain changes in the process. 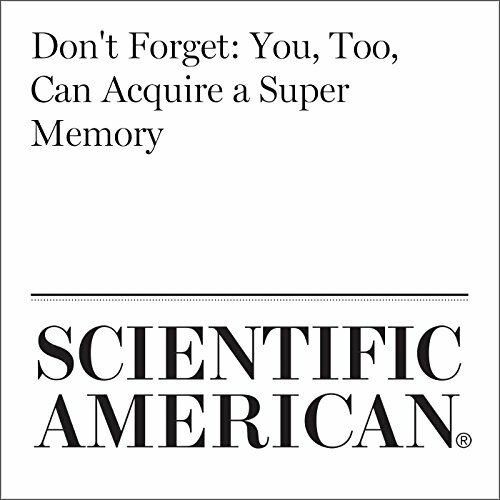 "Don't Forget: You, Too, Can Acquire a Super Memory" is from scientificamerican.com, published on March 9, 2017.